This Adafruit plate makes it easy to use a 16×2 Character LCD. Unfortunately, these LCDs do require quite a few digital pins, 6 to control the LCD and then perhaps another 3 to control the RGB backlight for a total of 9 pins. That’s nearly all the GPIO available on a Raspberry Pi! You will either have a RGB LCD Plate or a Blue & White one. The functionality for the two is similar, the only difference is in the colours displayed. You can recognise easily that you have a RGB or Blue&White one by looking at the number of soldered pins above the screen. The RGB one has 18, while the Blue&White one has 16. The backlights will not turn on until you have the code running so don’t be alarmed if nothing lights up when you plug in the plate! If you have a ‘positive’ style LCD, you may see some squares on the first line, that’s normal. to the end of the file. Then save the file and reboot the Pi (type sudo reboot in the terminal) to enable the hardware I2C driver. This will search /dev/i2c-0 or /dev/i2c-1 for all address, and if an Adafruit LCD Plate is connected, it should show up at 0x20, as per the figure above. Once both of these packages have been installed, you have everything you need to get started accessing I2C and SMBus devices in Python. The plate uses a character LCD with an external yellow contrast potentiometer. The first time you use it, adjust the potentiometer in the bottom right (with a screwdriver or something similar) until you see the text clearly. If you don’t upload code to the Pi, some boxes may appear instead, or you may see nothing at all. Interfacing with the python example code is fairly easy! Inside the Adafruit_CharLCDPlate folder you’ll find a testLCD.py python script. The script does a few things, at the top it imports all the sub-modules. You’ll need to have the Adafruit_I2C.py, Adafruit_MCP230xx.py and Adafruit_CharLCDPlate.py python files to be in the same directory so be sure to copy them to your final destination. Next it initializes the plate with lcd = Adafruit_CharLCDPlate() – this creates the lcd object and starts communicating with the plate to set up the LCD and buttons. After initialization, you can clear the display with lcd.clear() and write text with lcd.message(“text goes here”) don’t forget that its only 16 characters per line, and it does not automatically wrap lines. To insert a newline use the special ‘\n’ character such as shown in the command: lcd.message(“Adafruit RGB LCD\nPlate w/Keypad!”). Next you can set the backlight with lcd.backlight(lcd.COLORNAME) where COLORNAME is RED, YELLOW, GREEN, TEAL, BLUE, VIOLET for RGB LCD’s or for monochrome LCDs, just use ON and OFF. Finally, you can ask the plate which buttons are pressed with buttonPressed(lcd.BUTTONNAME) where BUTTONNAME is LEFT RIGHT UP DOWN or SELECT. This is not an interrupt-driven library so you can’t have an interrupt go off when a button in pressed, instead you’ll have to query the button in a loop. 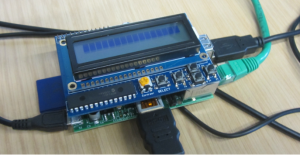 Here is a python script which can test the internet connectivity on your raspberry pi and display whether there is internet connection, by pinging google. It also displays the Pi`s IP Address on the screen. b) Open a new python script by typing nano ConnectivityTest.py (instead of “ConnectivityTest” you can give it any name). A blank file will open in the terminal. Copy and paste the code into this blank file and then save it and close using the Ctrl+x command. c) Type sudo python ConnectivityTest.py in the terminal. The LCD should show “Connectivity Test” written on the screen. Press “Select” and, if there is connectivity test, a green display should pop-up saying “Testing Connectivity” followed by a yellow screen which will display the IP address of the PI as well as the IP address of ? ? #The following while loop controls the LCD menu and the control using the keypad through the menu.